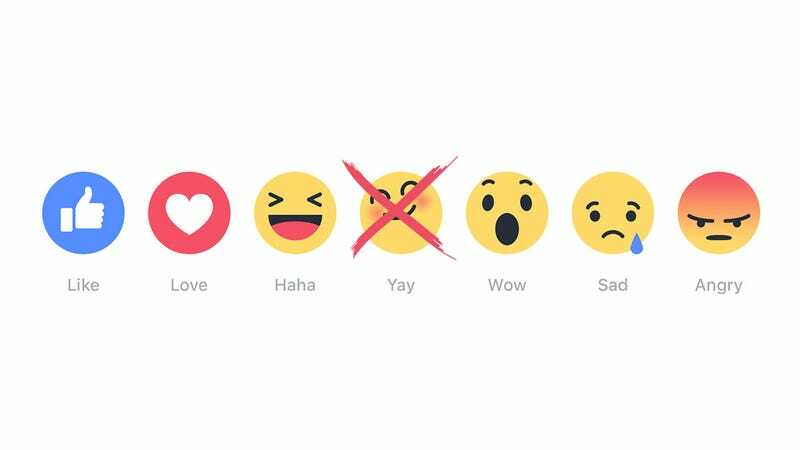 We have no way of knowing why Facebook rejected the “Yay” button. But it’s kind of funny because “Yay” is slang for cocaine! Realistically, however, the world probably won’t be getting a “Yay” button because joy is confusing. Bloomberg’s lengthy report on the story behind the Facebook’s new reaction emoji, which are set to arrive “in the next few weeks,” goes through chief product officer Chris Cox’s mental process. Cox quickly rejects the idea of the oft-requested “Dislike” button saying it would “sow too much negativity.” So, what became a simple binary solution boomed into seven reactions with room for much more nuance. But that number has now dwindled to six. How could something as outwardly harmless as “Yay” be “not universally understood?” I guess “Yay” could simply mean yes, like in “yay or nay.” It’s also kinda overkill when preceded by Like, Love, and Haha. But, there’s also that whole thing that “Yay” is slang for cocaine. Suddenly, that blush-filled emoji looks a little too tweaked out.